Johannesburg - Labour Minister Mildred Oliphant is worried about the number of retrenchments that might follow after the implementation of the national minimum wage, which labour federation Cosatu is seeking to implement as early as January. This comes in the same week Oliphant presented her report to an ANC meeting at Luthuli House to seek guidance on the matter from, among others, President Jacob Zuma. Oliphant said that what was left now was simply to agree on what the figure should be. Trade unions want an immediate agreement and implementation of a minimum wage, but business has been accused of stalling and not attending meetings to finalise talks with all stakeholders. Oliphant told City Press that employers already had a negative attitude towards government’s plan for a minimum wage, a situation that necessitated trade unions to be honest when considering how much the national minimum wage should be. “I’m very concerned that inflation could shoot up and unemployment and retrenchments could go sky-high. “What’s happening is that it’s not just the [amount of] R4 500 called for by Cosatu; others are saying it should be R12 500. Initially, there were those saying it should be R7 000, but they dropped that figure,” she said. Oliphant said employers could agree on a figure, but were likely to do an about-turn and come up with a package to retrench workers by saying they could not afford to pay them the agreed amount. She said that at the same time as negotiations on the national minimum wage continued, government was mindful of a possible recession. Currently, there is no agreement about the figure, with Cosatu crying foul about business frustrating the process and leading to unnecessary delays. Oliphant said she was waiting for research reports, which would also look into whether workers in “ultralow-wage sectors” such as farming and domestic work could be excluded, as happens in other countries. At its national congress this week, Cosatu decided to minimise the exclusions and exemptions from the national minimum wage. It was agreed that, as a compromise, domestic workers, farm workers and even those employed in public works projects, should start off with slightly lower wages of about 80% of the general minimum wage. 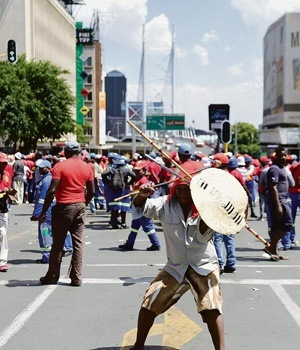 But the stalemate at Nedlac, the consensus-seeking body between government, labour, business and civil society, has irked Cosatu so much that it wants the ANC to take a stronger stance on what it calls “delaying tactics and foot-dragging” by business. Cosatu’s declaration reads: “The national minimum wage is a matter of life and death for workers. The conduct of refusing to discuss the level of the national minimum wage is entirely unacceptable and will be strongly opposed. Cosatu has also threatened to initiate a campaign to boycott employers who refuse to comply with the set figure. It supports an international benchmark for setting the national minimum wage at 40% or 50% of the average wage. The average wage of workers in the formal sector in South Africa is said to be about R10 000. Oliphant said she expected one of three research reports on the matter to be on her desk by the end of this month. She presented a progress report to ANC officials at a national working committee meeting on Monday. “They appreciate the report and will support us to look at the issue – in particular, to compare what will transpire from the research report,” she said.